When the Community user rejects an edit during the grace period there is no obvious reason visible (example). Why does the Community User reject / approve edits? 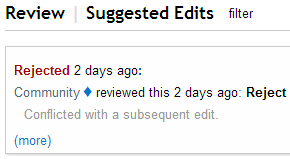 What caused Community ♦ to reject this particular edit suggestion? I’m afraid these “rejects without a reason” are not helpful and rather discouraging. A short explanation would be useful, and the suggester could learn something. These rejections do not count toward edit bans or warnings. It's more than just discouraging, each rejection has impact on the user suggesting the edit as it might lead to a ban. I agree that those poor souls deserve to know the reason why their edit got rejected, same way that flesh and blood users can choose or write a reason. This happened to me today here. The edit that I suggested came 13 minutes after the question was posted so it wasn't that the question was edited within the grace period. Also, there is no evidence to support that a reviewer improved on the post by further editing it and marking my edit as unhelpful. The post was edited by another user at a later stage but I believe this to be unrelated. If a reject reason was added as suggested here, it would make the process much more user friendly and potentially reduce the number of new questions being opened requesting clarification for the reject reason. As noted by Sha Wiz Dow Ard, the community user is rejecting quite a few suggested edits lately (examples from same user 1, 2). Perhaps there is some issue with it? If this behaviour continues, it will likely put people off suggesting edits and that would be a shame seeing as they are trying to improve on the quality of the content on the site. As I had this happen to me today (on WPSE), I was unsure of whether there was an inherent problem with the edit or not - obviously not. This should be mandatory as the user being rejected might actually consider the edit to have been rejected by a real reviewer and as you suggest, with no explanation, that's discouraging. Going to completely support this one. A user posted a question with some unrelated tags (presumably for the purpose of making the question more visible), so I suggested an edit removing all the superfluous ones. Two real people quickly approved, and then I saw it was rejected by Community. No explanation, basically just a f**k you. This pretty much sends the message that I should stop bothering to make edits (at least until I have enough rep that I don't need them approved) - especially considering this isn't the first time one of my edits has been approved by two real people (other times more substantial than just a re-tag) and then shot down by the Community bot. Not the answer you're looking for? Browse other questions tagged feature-request status-completed review rejected-edits rejection-reasons . Edit was rejected without reviews? Why did community user reject this edit? When suggestion is rejected in Improve/Edit, why are reviewer's stats not displayed?